A fine spring morning in march and I finally got the chance to climb Cuilcagh an hours drive from my base in Sligo. I chose the excellent route from the south starting at Bellavally Gap as suggested by Doneig supported with a good set of GPS coordinates. 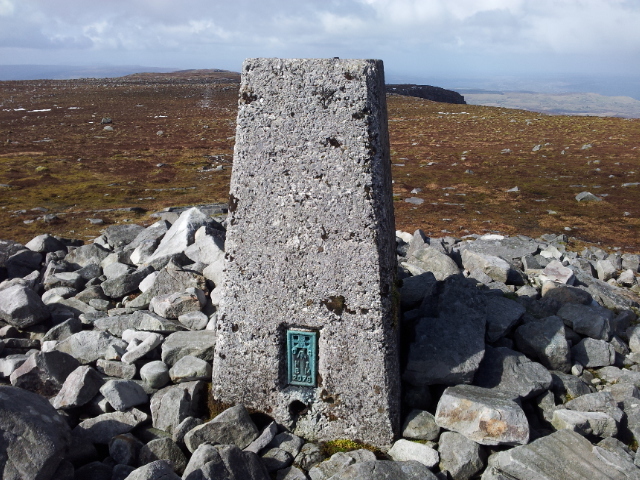 It was a short pull up to the non descript summit of Benbeg from where the vista of the route ahead opened up, a sweeping escarpment arcing around to a Cuilcagh peak. This really is a vast wilderness area with the bog stretching nearly 6km east to Swanlinbar. It is best to stick to the rough track that follows the edge of the escarpment down to a damp coll halfway to the summit. Do take care on this route as there were a couple of areas of significant subsidence. If you veer too far inland to the west you will encounter heavier going and have to navigate through a forest of peat hags. From the col the ground rises gently and dries out as you reach the rock strewn summit plateau. A squally hail shower greeted me as I reached the summit which sported a thin crust of snow. I took shelter in a small stone enclosure beside the Trig point. The area betrayed the signs of significant human traffic with many bootprints and the discarded debris of some ignorant buffoons There were crisp and chocolate wrappers as well as drinks bottles and paper cups stuffed into the cracks.